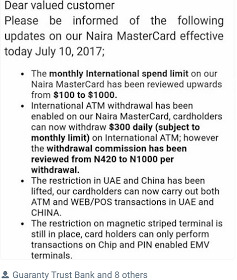 GTBank has officially lifted the limits on naira MasterCard for foreign transactions, after several months of inconvenience. The previous limit has led to many of us Bloggers and internet marketers to get a dollar account with MasterCard just to purchase or renew one stuff or the other. The uplifting news that we have been waiting for is here. You can now use your GTBank Naira MasterCard on foreign sites, shop/purchase on foreign sites and renew whatsoever you want to renew with a monthly limit of $1000. Now, you don't necessarily need a dollar account just to purchase things from foreign sites. The bad news is that to make withdrawals with your naira master card abroad, you'll be charge N1000 instead of N420; and you can only withdrawal $300 daily. Now, what we will be talking about is the conversion rate of GTBank. Someone was charged 380/$ on GTBank naira MasterCard, and it's still very high if you ask me. Be that as it may, have you carried out any foreign transaction recently with your Naira MasterCard? Tell us at what rate did your bank converted for you. I knew there will always be comma. GTB be like devil. If they are giving you something, ask for the terms and conditions. I just hate this bank. If not for the fact that one can buy things online with their Card, man for don move.